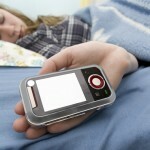 As its name implies, sleep texting is texting while one is asleep. Usually the victim of sleep texting starts out texting while awake, falls asleep, and then continues texting while catching some Z’s. In a recent broadcast about this phenomenon, NBC News reporters interviewed Dr. Mike Howell, a sleep doctor with the University of Minnesota Sleep Medicine Clinic. Dr. Howell noted that those most likely to sleep text are young people who come to him suffering from sleep deprivation and who are strongly attached to their phones. When they sleep text they’re not quite awake and not quite asleep, according to the news station, which reported sometimes embarrassing scenarios for sleep texters – such as one young woman who unwittingly found herself texting an ex-boyfriend in her sleep, saying things that made her waking self cringe. Sleep texting is no laughing matter. 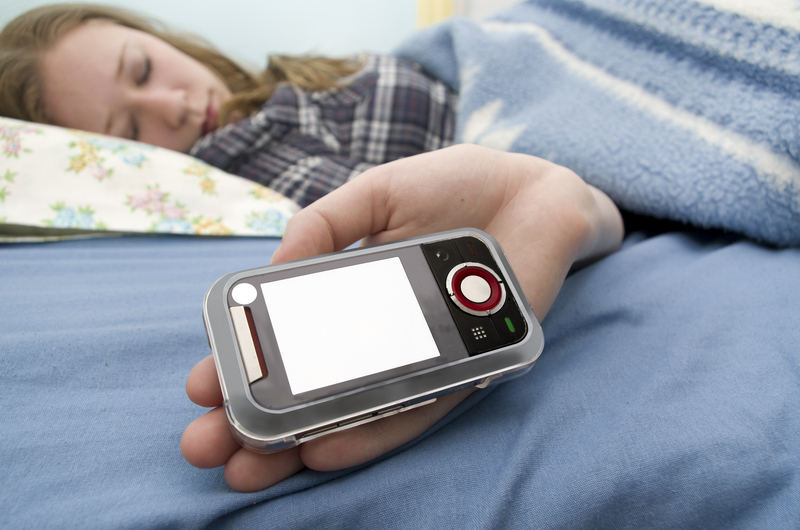 Doctors say sleep deprivation – one of the results of sleep texting – can have dangerous side effects such as heart problems, obesity, depression and worse. To cure patients of sleep texting, doctors prescribe unplugging from phones and other technology for at least four days. During that time patients may feel withdrawal symptoms, but ultimately they begin to feel relief, according to the NBC report. If your children are a little too plugged in to technology, you might have noticed some unwanted side effects. Digital overload has been associated with a host of problems, including attention difficulties, low grades, impaired sleep, obesity and withdrawal from family life, among others. Know how much is too much. The American Academy of Pediatrics says that young children shouldn’t spend more than two hours a day plugged into technology. If your child is spending more than that – and the average child does spend an average of eight hours – it’s time to set limits. Declare ‘Unplug and Reconnect’ time. Specify a special tech-free time of day. Enjoy a meal without interruptions. Plan a family game night. The goal is to disconnect from technology and to find time to reconnect with your family. Offer alternatives. Help your child develop a list of entertaining, technology-free games and other activities they could do by themselves or with the family. Show them that there’s a world of fun beyond the Internet. Get moving. Today’s technology-addicted children are more sedentary than is good for them – which may explain why childhood obesity and Type II diabetes rates are soaring. Encourage physical play – perhaps even a family touch football game now and then. Foster a balance. Establish a rule that technology use must be balanced with other activities. Tell your children that every hour spent surfing the Internet must be offset by an hour playing a non-technological activity. Set a good example. Your children will often emulate your behavior. If you think they’ve become too consumed by technology, make sure that the same isn’t true of your own technology use. While e-books may be on the rise among Kindle-loving parents, there’s nothing like printed books for their children, according to a story appearing in the New York Times on Nov. 21. While sales of digital books to adults are proceeding at a faster-than-expected pace, sales of e-books meant for children represent less than 5 percent of total annual sales of children’s books, according to the Times article. This is heartening news to the staff at Unplug and Reconnect. Recently, we reported on the video of the “iPad baby,” a cute toddler who clearly confuses the pages of several magazines with her parent’s iPad. The little girl becomes bored when she can’t manipulate the pages as she would an iPad and soon pushes the magazines aside. “How valuable can it be for a baby to learn that mom’s iPad, with its flashy moving images, is way cooler than the printed page?,” we lamented. We’re glad to know that many parents apparently agree that there’s nothing like the printed word. Literally. What’s on your child’s wish list this holiday season? Chances are it’s something that plugs in, lights up, rings, zings and pings. And chances are they will be able to “connect” with unknown “friends” from around the globe, while oblivious to family and friends sitting around the dining table. With this in mind, Unplug & Reconnect is recommending its pick of the hottest “unplugged toys” of 2011. These recommended toys, culled from myriad top toy lists of the current season, all have one thing in common – the only plug-in they require is a child’s imagination. What’s not to like about LEGO building blocks, featuring colorful interlocking plastic bricks and an accompanying array of gears, figurines, and various other parts – with themes for every age group? Hot this year is LEGO Harry Potter Hogwarts (Age 8+), which lets young wizards build and recreate the battle between Harry Potter and his friends vs. the Death Eaters and Dementors ($116.97). For the younger set, try LEGO Duplo Learning (Age 3+), with big, colorful, numbered bricks for endless hours of learning through play ($24.99). Also promising hours of fun is the LEGO Toy Story Western Train Chase (Age 7+) – roll down the tracks with Buzz Lightyear, Woody, Jessie, Bullseye, and Rex while trying to escape from the “Evil Doctor Porkchops ($70.99). Families will enjoy the LEGO Creationary Game (Age 7+), which challenges players to guess what other players have built, charades style ($32.30). Playmobil is an enduring line of collectible action sets featuring small plastic people and animals – from pirates and police officers, dragons, Vikings and fairy tale princesses – amidst castles, ghost ships, puppet theaters, western forts, and a variety of other settings. Hot for 2011 is the Playmobil My Take Along Puppet Theater (Ages 4+), which lets children stage their own puppet show for the Playmobil characters to act out ($49.99), and the Playmobil Figure Set Furnished School Set (Ages 3+), providing a great setting for hours of play school ($99.99). Lalaloopsy Silly Hair Doll by MGA (Ages 4+). This season’s “it” doll, the Lalaloopsy were once rag dolls who magically came to life, taking on the personalities of the fabrics that were used to make them. The Lalaloopsy have silly hair that bends every which way, and come with their own hair styling brush, clips and beads. Clothing and accessories sold separately ( $29.99). Angry Birds: Knock on Wood Game by Mattel. (Ages 5+) A hands-on, unplugged version of the touchscreen phone app, for two to four players. This game follows the same goals as the online version: launch the Angry Birds toward the egg-stealing pigs’ wooden castles to destroy them to advance to the next level ($26.99). Real Construction Deluxe Took Workshop by Jakks Pacific (Age 6+). A great way to strengthen problem-solving skills and nurture creativity without a mess! Featuring a real saw, hammer, screwdriver and more, the workshop lets children come up with their own projects and figure out different ways to build them ($24). Squinkies Cupcake Surprise Bakeshop by Blip (Ages 4+). The hot new toy for 2011, Squinkies feature miniature worlds of imagination. Put a “coin” in a slot, turn a dial, and the fun world of Squinkies begins in the palm of your hand! Once you open the cupcake you will find your own bake shop and hours of fun playing with the Squinkies figures ($29.99)! Rory’s Story Cubes by Gamewright. (Ages 8+). Everyone who plays is transformed into a master storyteller with this pocket-sized idea factory. Just roll the dice and use the pictures that come up to create a tale. A great party game and ice breaker ($6.71)! Eco-Kids-Eco-Crayons available at LuckyVitamin.com (Ages 2+). No childhood is complete without crayons, so why not get them nontoxic and eco-safe crayons? Features six crayons handmade with natural and organic fruit, plant and vegetable extracts, soy, bee and palm wax ($9.99). Hot Wheels Wall Tracks Starter Set by Mattel (Ages 4+). Hot Wheels racetracks are always fun. Now take it to a whole new level. Using the wall mount track, your child can expand the world of Hot Wheels and create stunts and tricks up and down the wall ($27.99)! Magnet Levitation Kit by Dowling Magnets (Ages 10+). Challenge your child to learn about equilibrium and magnetic fields while constructing an incredible gravity-defying train. Designed for older kids who love science, this kit comes with tons of educational components and a comprehensive “how to” guidebook with step-by-step instructions. A must-have for science fairs ($25.95).